So, if you haven’t already guessed, I’m a very hungry person. Like that silly caterpillar, I totally graze through tons of food and it’s kinda fun to make the food, well, fun. 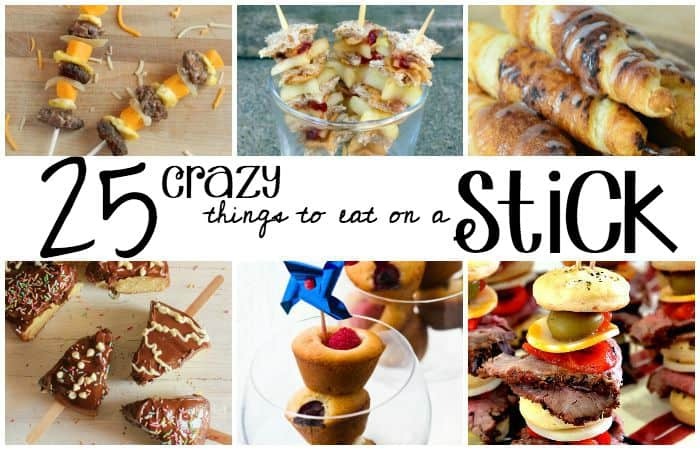 So, I went hunting for Crazy Things to Eat On A Stick, which makes food more fun. Right? I mean, stick and food and fun…Right? LOL! 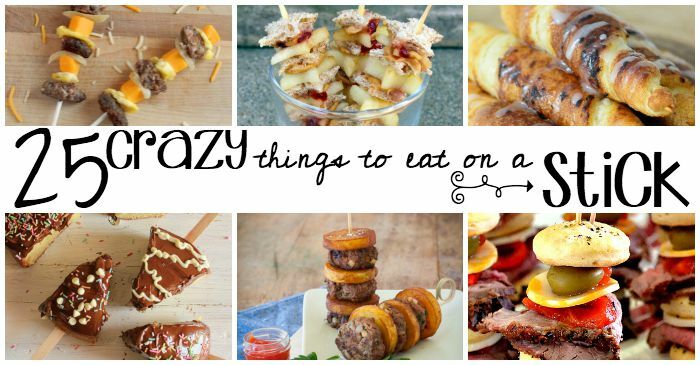 Breakfast on a Stick for Lunch What better way to use those leftover breakfast foods? My grandson loves these mini-kabobs! Trio of Mini Muffins – On Party Skewers This is such a cute idea! Mini muffins and pinwheels to celebrate any occasion! Grilled Ground Meat Kabobs Prepared from ground lamb or turkey, and on the table in under 30 minutes! Matt Armendariz’s Caprese Sticks These Caprese Sticks look so yummy, my mouth is watering! Tuna and Avocado Skewers Fresh tuna and avocado grilled together on a stick? Can you say “dinner’s ready”! Antipasto Skewers with Herb Vinaigrette Appetizer on a stick, anyone? Grilled Chicken Caesar Kebab Salads–I LOVE grilled chicken Caesar salad, and grilling it on a skewer just makes it that much better! Shrimp and Spanish Chorizo Bites Shrimp + Spanish Chorizo = SCRUMPTIOUS!! Tofu Kebabs Made with Tofu–just in case you prefer a Vegan dish! Smoky Paprika Shrimp Skewers MMM…I DO LOVE a good grilled shrimp! Pork Kebabs with Apples and Potatoes These Kabobs just look so appetizing…guess I know what’s going to be supper! Campfire Cinnamon Roll-ups Three ingredients, a campfire, and irresistible yumminess! Ranch Chicken Bacon Kabobs Well, this could be the BEST chicken Kabob recipe in the world! Lemon and Dill Barbecue Salmon Kabobs Salmon on the grill is good, but this recipe with Lemon and Dill makes the salmon GREAT! Chef Salad: Food on a Stick I’m crazy about salads, and this one looks amazing! This would be a great idean when you’re entertaining. Steak/Frites en Brochettes A picture is worth a thousand words, and this picture portrays lots of flavor! Strawberry Shortcake Kabobs! Oh-My-Goodness! I hope all the right ingredients are in my pantry! Excuse me for a minute while I prepare some Strawberry Shortcake Kabobs! Vanilla Cake on a Stick No plate…no fork…just CAKE ON A STICK! Antipasti Kabobs Beautiful AND delicious! Healthy Summer Snacks with Taste of Nature THIS is the most delicious-looking fresh fruit I’ve ever seen! Peanut Butter and Jelly Bite Size Kabobs What could be more fun than Peanut Butter and Jelly on a stick? Grilled Pineapple Kabobs with Honey Yogurt Sauce Have you ever eaten grilled pineapple? You’ve GOT to try this! Strawberry Brownie Kabobs Strawberries are one of my favorite foods…but, if they weren’t already, they would be after trying these strawberry brownie kabobs! Steak Sandwich Stackers What a GREAT idea for when you’re entertaining friends! Antipasto Salad Kabobs This may be called a salad, but it looks like a meal to me!